Apart from that, the animation of the horses is realistic and the sound effects appropriately sparse. It's really a question of horses for courses: if you like a bet on the nags, take a look. The graphics are not bad, by any standard, but they are little too functional. And for the most part the same applies to the sound. But that said, I like the sampled speech which announces the winners, although the jingly tunes that plays on the options screen grates slightly. It is fun, there is no doubt about that, but I do feel that it could do with a steroid or two in both gameplay and variety, and probably falters in the lastability stakes. Grand National überragt sicherlich nicht in grafischer Hinsicht, hat aber durch die Verbindung von Action und Strategie einen guten Eindruck hinterlassen. Wer mal vom Fußball-Manager angetan war, könnte sich u.U. auch für den (harten) Pferdesport erwärmen. Well, I look upon this year's Grand National favourably because I won third prize in the Newsfield sweepstake. But the computer game... It was released on 8-bit years ago and gameplay hasn't been enhanced since. You'll play it till you finish in the top four, and if you've determined, even until you win it. But after that, Grand National will be condemned to the depths of your software collection. 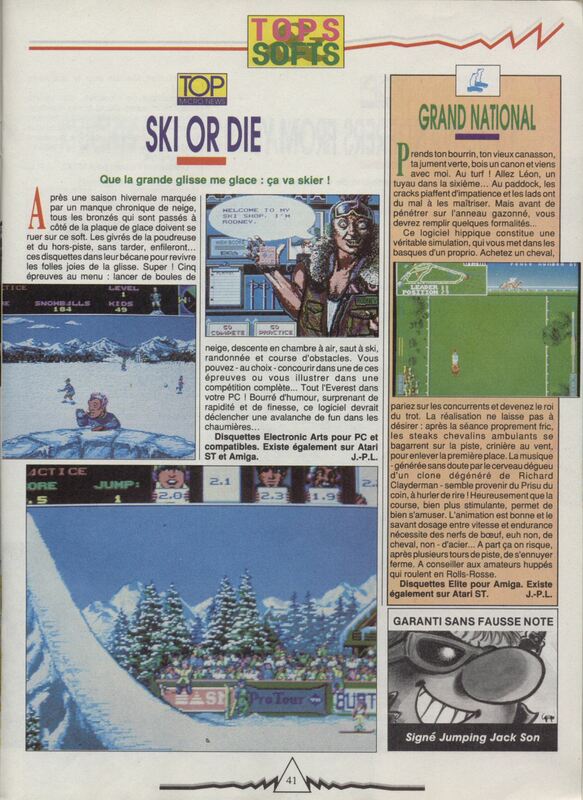 Grand National est le meilleur jeu du genre, mais je doute qu'il puisse vous passionner très longtemps. L'ambiance des courses, ça se recrée difficilement sur micro ! 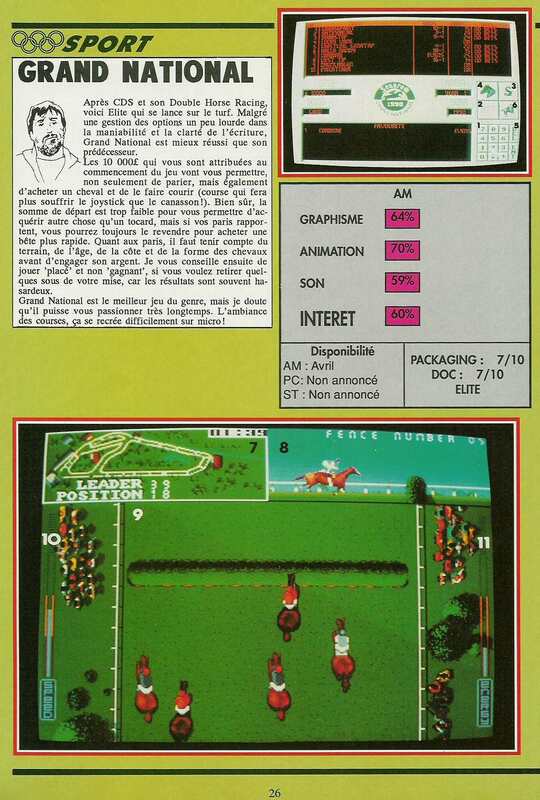 Une véritable simulation achat des chevaux, paris...La course elle même est plus stimulante: l'animation est bonne et le savant dosage entre vitesse et endurance nécessite des nerfs d'acier. A part ça on risque de s'ennuyer ferme. A conseiller aux amateurs huppés. La musique est à hurler de rire. Insgesamt glänzt Grand National durch kaum vorhandenen Spielspaß: Das strategische Element beschränkt sich auf die Auswahl des richtigen Pferdes, und der Action-Teil ist so langweilig, daß er die Bezeichnung eigentlich gar nicht verdient. Wie so oft beim richtigen Pferderennen: außer Spesen nix gewesen! Elite really should know better than to server up third rate games like this. Give the twenty quid to the RSPCA instead.